Further to my earlier post this morning (Friday 27th) I found myself in the house on my own and all was quiet……….kids out, Mr Bluebell out, dogs quiet, cats akimbo on the beds upstairs. A peaceful, quiescent atmosphere…………..a rarity in the Bluebell Household, so I took my half-finished bottle of prosecco, walked (mostly in a straight line) to the reading chair and started the new addition to my bookcase……………….Dead Gone by Luca Veste. I write this post in the dead of the night, I had to, I can’t sleep, I started the book at approximately 5pm and finished the book completely in one sitting. 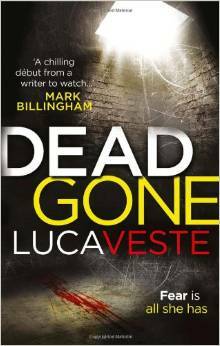 Dead Gone by Luca Veste is his debut novel, definitely an author to watch and having a love of crime thrillers myself it will definitely take pride of place with space for more of his books. Set in Liverpool, drawing on his Liverpudlian and Italian roots the setting and staging of this story is intriguing and unnerving, it draws you in immediately and makes you feel you are standing right there with him as he tells the story. I literally couldn’t put it down and after a bottle of the bubbly stuff one needs to powder ones nose frequently, however I was rooted to the spot. DI Murphy and DC Rossi are the lead characters in this book, both having their own issues to deal with but fabulous characters. They interact with each other fabulously, their relationship is wonderful and note that they were quite fond of each other. Jemma Barnes is a victim, disappears without a trace on a rare night out and the story that unfolds thereafter is compelling, frightening, so real, and psychologically dark. I often wonder about the minds of the authors that can write such stories. A body is found, soon after the disappearance of Jemma, a seemingly controlling husband is in the frame, although her family thinks she’s just upped and left, apparently it’s happened before but Jemma’s partner can just not believe it. The body that was found turns out to be one of many experiments and is not Jemma. The book is written from three perspectives, 1. being from the husband, whose wife (Jemma) has gone missing 11 months prior, 2. the police led by the commanding but human DI Murphy in real-time and 3. from the captors lair. Each chapter jumps from story to story but is clearly headed so you know where you are.